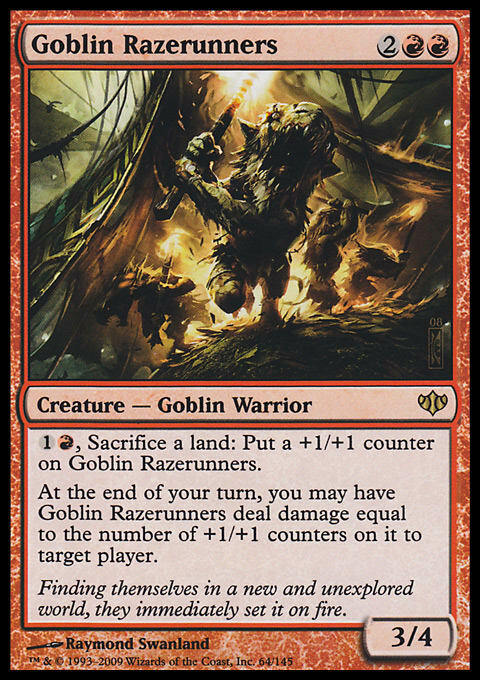 "I'll tap two and sacrifice a Swamp to give my Goblin Razerunners another +1/+1 counter,” Harriet says. She thinks for a while, reaches for her remaining lands, and then hesitates. Then she reaches for them again, and taps the rest. “I’ll sacrifice my Blood Pet for a total of four mana,” she says. “I’ll cast a Dread Specter with that,” Harriet says, playing the last card in her hand. You raise an eyebrow. “What’s not very nice?” you ask. “But I’m not doing anything at all,” you say. Puzzled, you glance at your side of the table. As far as you’re aware, you’re in a solid position at the moment, but it’s not like you have an overwhelming advantage. Well... you do have a couple of four-power flyers against Harriet’s lesser air force. And you do have an indestructible Krosan Beast standing guard. And you do have an Elven Palisade to blunt Harriet’s attacks, as well as a Sanctum Guardian to stop anything else that gets through... okay, maybe Harriet does have reason to worry. “The worst part is that you’ve had that Tolsimir staring at me for most of this game,” Harriet notes. You sigh. If Harriet really wanted to lose this game, she wouldn’t have stifled your Krosan Beast by having her Withered Wretch eat most of your graveyard. You get the worst opponents sometimes. “Are you attacking?” you ask. It is the start of your first main phase. Defeat Harriet before the beginning of her next combat phase. You have not yet played a land this turn. You still have a substantial number of cards remaining in your library, but you know neither the identities nor the order of those cards. You're sure you still have some Plains in there, though. If you think you’ve got a great solution in mind, don’t put it in the comments! Instead, send it to puzzles@gatheringmagic.com with the subject line “Puzzle - They Travel in Packs” by 11:59 P.M. EST on Monday, April 15, 2019. We’ll… one moment, please... wait, what? It looks like Sean will be out of town for a few weeks again! (No, he’s not running with the wolves.) While the next few puzzle articles will still go up every Thursday as scheduled, their solutions will be placed on hold until Sean gets back. Our submission dates still apply, so if you want your solution for a puzzle to be considered, you’ll still have to send it in by its respective deadline. We’ll update these puzzles as soon as possible once Sean returns to regular writing duties! Correct solutions to last week’s puzzle were received from Addison Fox, Hyman Rosen, Russell Jones, Matt Bocek, Kirk Maijala, Sean Patrick Keatley, Michael Feldman, Greg Dreher, Mike Rondeau, Max Bernstein, Brandon Butchko, Chris Billard, and Mike Strasburg. “Here's a puzzle where simple math tells you how to proceed,” Greg Dreher writes. “Twenty life is a tall order, and Verne's board is solid. You have one reliable form of evasion - Traitor's Clutch - and only one creature that can possibly get big enough, the B-I-N-G-O hinted at from the title of this puzzle. We have 10 mana, . Spend to cast Demonic Vigor on our Avatar of Might (9 left). This puts a '1' chip counter on B-I-N-G-O. Spend to sacrifice the Avatar of Might to Quagmire Druid and destroy our own Aspect of Mongoose, returning both the Avatar and the Aspect to our hand (8 left). Recast the Aspect of Mongoose for , targeting the Bramble Elemental that Verne just reanimated - giving Verne two Saproling tokens, and putting a '2' chip counter on our dog (6 left). 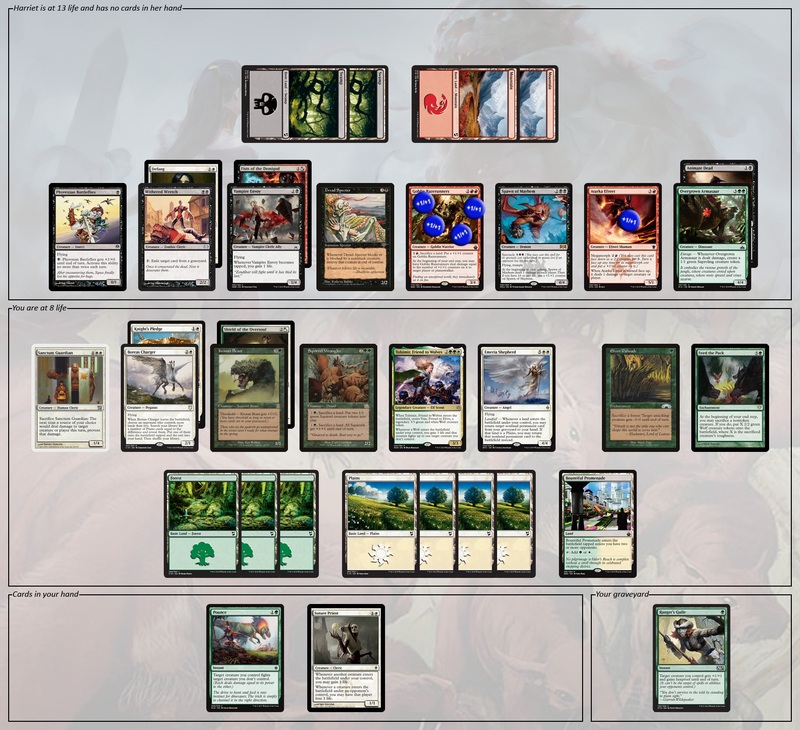 Pay and 3 life to flashback Crippling Fatigue on our own Exiled Boggart, killing it and putting a '3' counter on B-I-N-G-O. We have to discard a card, and pitch the Traitor's Clutch (4 left). Having killed two of our own creatures and donated two to Verne, we can now cast Avatar for only , putting the elusive '8' counter on B-I-N-G-O for a 75% discount. This leaves us to flashback Traitor's Clutch on B-I-N-G-O. While we're only paying two mana, it's a 5 CMC spell, completing two rows (1-8-2 vertically and 8-5-3 horizontally) for a total of +18/+18. The Clutch gives us +1/+0 for a total of 20 power that Verne can't block, since nothing else in play has Shadow. This solution has one minor variant: You can also use Quagmire Druid to sacrifice your Greenwarden of Murasa instead, getting back a Slaughter Pact that you can then cast to off your Avatar of Might. This gets you a chip counter on B-I-N-G-O's ‘0’ slot, but doesn’t get further than that because you’re not able to get either the ‘6’ or the ‘4’ slots without compromising your win. The bonus, of course, is that all this gives Verne another story to tell. “And victory was his name-o,” Greg muses.